The Trackmobile Layout Design Contest is now complete. Winners are announced below. In addition, this page includes several layouts and Trackmobile Tips and Tricks that surfaced during the contest, but were not part of the voting. Some of them may give you an additional idea or two that you can use in your own layout projects. In my estimation, the competition was a great success! We received 30 outstanding micro layout designs from seven countries: United States (15 entries), United Kingdom (5), The Netherlands (4), Germany (3), and one each from Canada, New Zealand, and Portugal. About 700 of you voted worldwide to choose the best designs, and the winners are international as well. 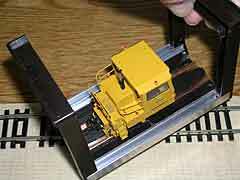 The top winner will receive a new Factory Direct Trackmobile DCC model. Runners up will be awarded a CD disk archive of this entire site (as of 1 July 2008). Many thanks to everyone who participated in this historic event! In real life, Cruz is a civil engineer working on hydro dam designs. He explains, “I draw my plans using the tools I use in my professional activity – a 3D CAD program (MicroStation).” The voters certainly liked his presentation! He also holds the record as the very last entry in the contest… his plan arrived less than an hour before the deadline! Congratulations, Cruz! Chris’s entry is an extended Tymesaver design, using the Trackmobile to serve a railroad car ferry (a popular transport mode in Washington State where his layout is set.) The ferry also doubles as a cassette for fiddling trains and consists. Chris is a long-time reader of this site, and makes his home far from the layout’s locale! A frequent contributor to this site, Alexander actually constructed his entry, hand laying the trackage from Peco Code 60 rail. He also built an attractive housing for the line, including built-in lighting and concealing the fiddle yard cassette at the right. This clever design takes advantage of the Trackmobile’s small size to squeeze in an Inglenook switching game in a very small space. Chad was the only entrant who provided an automated way to simulate the Trackmobile’s rubber-tired movement: the concealed turntable beneath the far-left silo. Like Cruz, Chad sent in his entry within the final two hours before the contest deadline… no doubt to keep secret a very creative effort! A COMPLETELY DIFFERENT TRACKMOBILE PROTOTYPE! 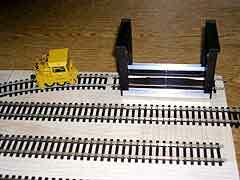 And Keith adds, “So I mocked up a potential micro layout (left). 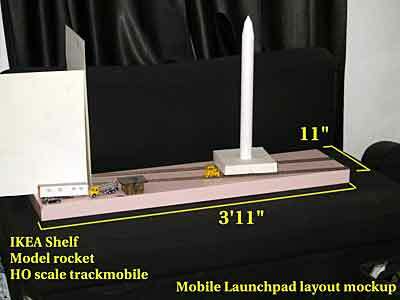 I have an IKEA shelf that is 47x11in, and a model rocket from the hobby shop… Ideally when complete the rocket and Trackmobile will be hidden inside the hanger building. 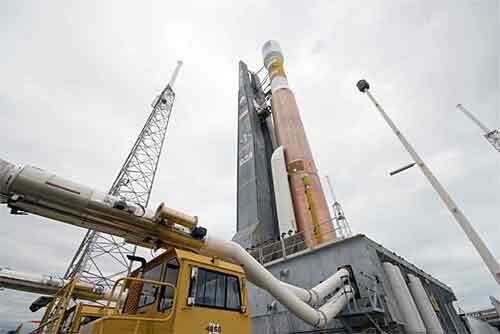 When powered, the rocket will start emerging from the building, hopefully to dramatic effect.” Wow! Craig Jenne, from San Francisco, California, USA, did not enter the contest. However, as he writes, “I went to Monterey Bay today and got inspired. I tried to put something together but alas I couldn’t get the plan together before midnight Eastern.” He sent the layout anyway — though too late for the competition — and it’s called Cannery Row. 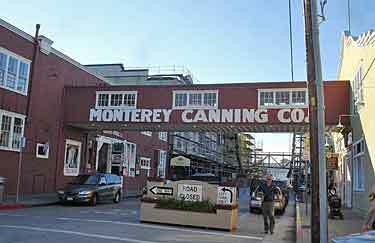 Cannery Row survives today and is served by rail! The sardine monopoly has been replace by a diversified seafood product range, oysters and mussels (both live and canned), squid, shrimp and yes, a few cans of sardines are still shipped. 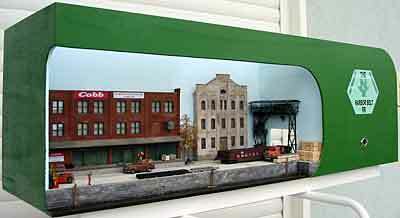 Craig has reproduced this atmospheric place, using an in-house Trackmobile to move freight cars in and around the various canneries on the waterfront. Craig added an ingenious “swivel plate” (sector table) to expedite traffic flow: “With a bit of imagination a runaround is possible. Cars are pulled from the right and spotted on the yellow track. The Trackmobile uncouples, moves onto the hidden swivel plate and simulates hopping off of one track and on to another (green) to complete the run around.” The result: a famous bit of Americana that also operates as a railroad! Another modeler who couldn’t quite get his entry together before the contest deadline was Hugh Flynn, from Featherstone, West Yorkshire, England. His layout design, Little-un, features a small fertiliser depot based in the U.K. “Ideally it would be only two wagons maximum being moved an 08 shunter and Trackmobile,” Hugh explains. “Also a few engineers wagons on the back line would not look out of place…” I imagine the title is some sort of regional joke, but I won’t ask! 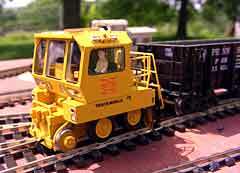 Jack Trollope, from the Highlands of Scotland, is a runner up in the Trackmobile contest. 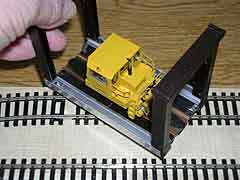 He also sent some photos of a Trackmobile rotator he’s developing for another layout, using a cut-down Peco Loco Lift. In Jack’s words: “I thought you might be interested in my Trackmobile rotator, so that it doesn’t need a second coupler added. 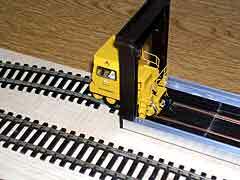 This will be hidden behind a building for operation, and will simulate the TM driving onto a road section with inset tracks, lowering the road wheels, making a three-point turn, driving back onto the tracks and raising the road wheels so that it has turned around.” It’s an ingenious idea that can be easily and cheaply used by anyone. 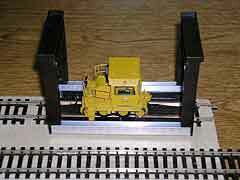 The photo sequence shows the operation. 4. Trackmobile turns more… 5. Trackmobile completes turn… 6. Reversed Trackmobile departs. AT LAST… A COMPLETELY PROTOTYPICAL TRACKMOBILE LAYOUT! Mike McLaughlin, from Denver, Colorado, USA, specializes in creative layouts that emulate prototype operations. 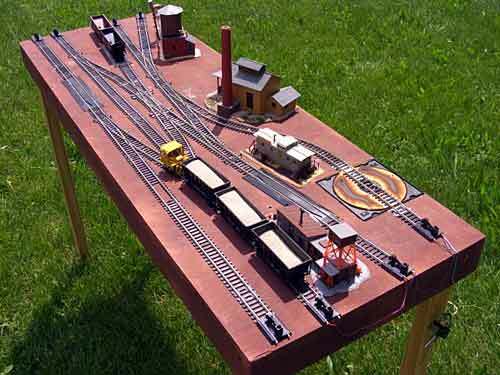 Along with his contest entry (Number 15), Mike sent along an amazing idea for a prototypical Trackmobile layout that might be the longest micro layout ever designed! 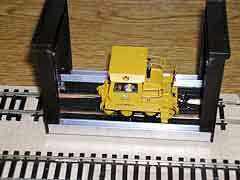 Mike began by observing that most Trackmobile layouts model tight industrial settings where crowded spaces, tight curves, and congested areas require frequent off-track operation. But there’s another typical Trackmobile situation, featuring “relatively low-volume spotting of cars for loading/unloading on easy grades, not capital-intensive, a one-man operation. 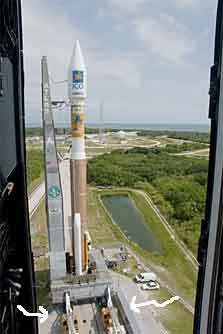 Think of a moderate grain elevator. “I came up with a plan (above, drawn up by Carl): a single-track ‘bench-work’ 2in x 24ft (576 square inches) with a grain elevator right smack in the middle. Since the prototype ain’t hardly ever dead level, a 0.5 percent grade overall, with a roughly 24in level spot right at the elevator, 0.7 percent down from the elevator for 5.5ft, then the 0.5 percent on to the end of the track. “Set out about 22 box cars above the elevator, and have the Trackmobile spot ’em in groups of three for loading one at a time. Move the loads down to the end of the track, ‘rubber’ back to the empties, pull down three more cars, rinse, repeat. Probably every other time, push the loads together at the end of the track. Yes, you read that right… this micro is 24 feet long (7.3 meters) — nearly half a scale mile! And it almost exactly duplicates prototype switching operations, foot for foot, meter for meter! I call that Thinking BIG.